This Lillys Smart, by WR This Cats Smart, and rider Steve Schlesinger went to the head of the class yesterday with a top score of 219.5 points, while Widows Freckles son Creepy Crawler and Luke Huggins turned out the lights in the last set of the day with 219. Buzzted, by Light N Lena, and Card Trick, by Lizzys Gotta Player, tied with 218.5 points, the third-highest score, under Sean Flynn and Matt Gaines, respectively. Flynn and Gaines also received high marks for their other mounts – Gaines with 217 points aboard Mercedes Smoothe, and Flynn with 216.5 riding Smoothlee As A Cat, both sired by Smooth As A Cat. Five-year-old This Smart Lilly, owned by Mark and Abigail Nelson, Wilton, Calif., made her debut with Schlesinger in the 2012 El Rancho Futurity, where she placed 15th in the finals. Last year, she claimed eighth with Schlesinger in the Pacific Coast Derby, her only other major finals to date. Steve SchlesingerSchlesinger, meanwhile, made his NCHA Futurity debut this past December showing This Smart Lilly’s half-brother, Check Counter, by Im Countin Checks, as a finalist in the Open (19th) and the Open Ltd. (7th) divisions, and will be back with the colt in the Super Stakes 4-Year-Old go-rounds. “The mare is one of my favorite horses to be around and to work on a daily basis,” said Schlesinger, 35, Lockeford, Calif. “She is a fast mover and has a lot of energy, so I need a cow that will take her somewhere and allow her to move. Schlesinger shows again on Friday, in the first set, riding 5-year-old Catisfaction, also by WR This Cats Smart, for Ted and Lauren Cooper, Shingle Springs, Calif. Lauren was an Amateur finalist on the gelding in the 2014 Pacific Coast Winter Roundup and will show him in the Super Stakes Amateur division, as well. Schlesinger’s open championships include the 2008 Pacific Coast Stakes and Derby aboard Cats Full Moon, the 2009 El Rancho Futurity with Scatman Cutters, and the 2010 Fort Klamath Ranch Festival Futurity on Hallie Cat. Six-year-old Creepy Crawler, owned by Buster Quirk, Denham Springs, La., was most recently a finalist in the 2014 Augusta Futurity (17th) under Austin Shepard, although Luke Huggins, Shepard’s assistant, showed the gelding to third place in the 2013 Breeders Invitational Open Ltd. Altogether, Creepy Crawler has been a finalist in eight open, non-pro or amateur events with Shepard, Huggins and Quirk, and has earned $32,066. Buzzted won last year’s NCHA Derby Open under Flynn and was most recently an Open finalist in the Cattlemen’s Derby (10th). 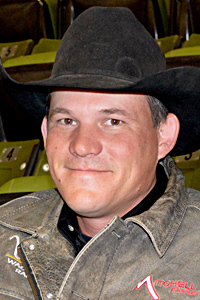 Todd Quirk had also showed Buzzted to third place in the 2014 Augusta Futurity 5/6 Non-Pro, and eighth in the Tunica Non-Pro Classic. Card Trick, owned by Reata Cutting Horses, Los Olivos, Calif, and shown by Matt Gaines, was reserve champion of the 2014 Tunica Classic; sixth in the Arbuckle Mountain Classic; and finished third and sixth, respectively, in the NCHA World Series at Houston, and the NCHA World Series at San Antonio.